The first film to use the word ‘gay’ in a scene associated with homosexuality was ‘Bringing up Baby’ in 1938. Cary Grant’s clothes have been sent to the cleaners, so he is forced to wear a woman’s feather-trimmed robe. When another character asks about his robe, he responds, ‘Because I just went gay all of a sudden!’ A homosexual connotation would still be unfamiliar to most film-goers, and simply suggested frivolity. Frivolousness and showiness in dress – ‘gay apparel’ – led to its association with camp and effeminacy, gradually narrowing the term towards its current meaning. With male homosexuality illegal until 1967, the acting profession in Great Britain used euphamisms or the ‘underworld’ language of Polari. ‘Sporty’ girls and ‘artistic’ boys were examples of public euphamisms. 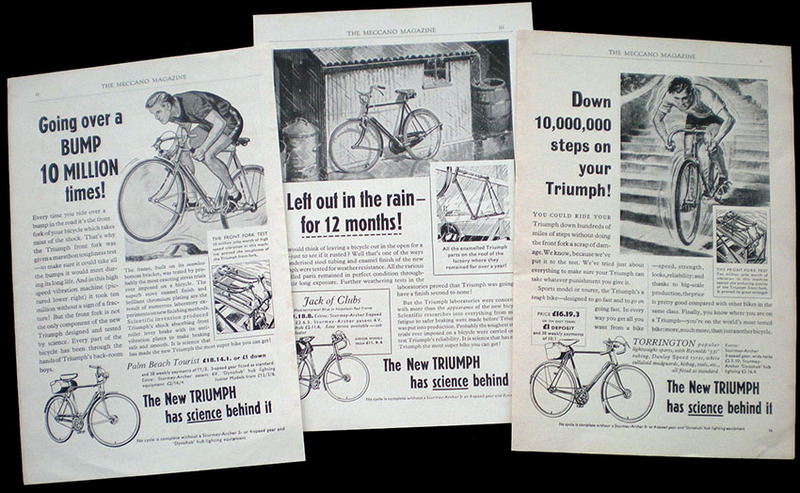 When the above advert appeared in Cycling magazine in 1910, the Triumph Cycle Co proudly declared that they employed ‘skilled male mechanics only.’ They needed to validate the high prices they charged for Triumphs: the market for top quality expensive bicycles was diminishing, and customers needed to know what they were getting for their money. Many smaller cycle companies went out of business in 1914, but the outbreak of war saved the larger manufacturers, who turned their factories over to war production. Though there was a shortage of parts to make them, there was no shortage of customers for bicycles, as motorised transportation was needed for the war. A major issue before WW1 was female emancipation. During WW1 women proved themselves in the workplace: with male staff at the Front, female labour was much needed – Triumph could not have used the above advert during the war. In 1960, Triumph again inadvertently used contentious wordage in their advertising bylines. Their catalogue of this year, which included the ‘Jack of Clubs,’ was launched with the slogan ‘Go Gay with Triumph.’ Fifty years apart, Triumph had indirectly commented on both female emancipation and gender emancipation. Another fifty years on, the word ‘gay’ has only one meaning, and the naivite of Triumph’s advertising campaign is rather quaint. 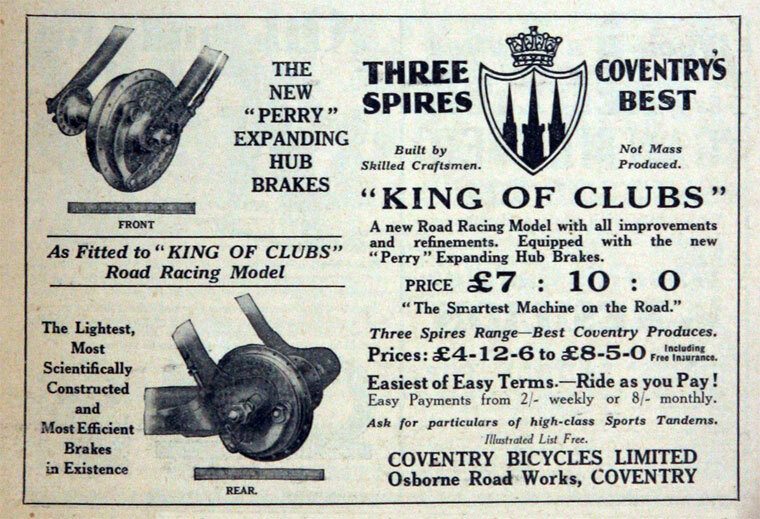 ‘King of Clubs’ and ‘Ace of Clubs’ models were introduced by the Three Spires Cycle Co before they were used for this Triumph model range. These adverts are from 1931. 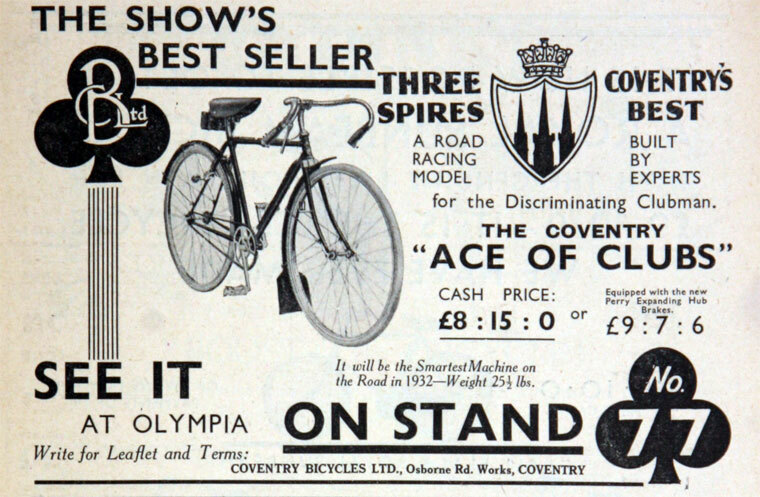 Three Spires Cycle Co was owned by Coventry Bicycles Ltd, who took over Triumph cycle production in 1936, and moved their factory to Triumph’s works in Priory St. The founders of Coventry Bicycles Ltd were Barbury and Downes, who had run the Hobart Cycle Co. In packs of cards, the Jack or Knave was historically a trickster or a royal manservant and, in French decks, considered to represent Lancelot. The Jack was also sometimes depicted as an ambiguous or female figure. The example below is from the Visconti tarot deck.